Customers buying printer ink in Cork at the moment are enjoying prices at an all time low with the readily available good quality compatible ink cartridges. Any good ink shop in Cork is able to supply these latest high quality compatibles that offer savings of up to 70% in some cases. 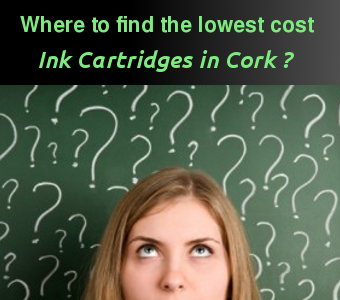 For example, the Epson, Brother and Canon compatible cartridges are among those ink cartridges in Cork offering the biggest savings, while the HP, Lexmark and Samsung ink and toner is not far behind. Businesses and home users alike are relying on printing more and more themselves finding it a cheaper alternative in some cases than using a commercial printer. If a hotel or restaurant requires daily menus then it has to find an affordable way to print without sending the job to a printer or paying the high price of an original brand cartridge. As we approach Christmas and spending increases, all businesses try to make that extra euro and are constantly producing printed matter to draw the punters in. Good value ink cartridges in Cork are becoming a more integral part of a budget for many businesses. This is one expense that can be reduced by using alternative replacement cartridges. The high standard of quality that is now available in these ink and toner cartridges can be confirmed by any good ink shop in Cork. So, as an experiment I will try to calculate if it is cheaper to produce your own leaflets than going to a commercial printer. We take 500 A5 leaflets printed one side as an example. Of course it will depend how much coverage of ink there is on the leaflet but if we calculate that overall there is about 10% total coverage of the page with printer ink – this may be mostly text with a few illustrations. The cost for a job like this at a commercial printer would be approximately €120 – €150. If you decided to print them yourself, on an Epson printer – say an Epson Stylus inkjet printer– You would normally get about 250 A5 pages per set of 4 cartridges @ 10% coverage. That means you would require up to 2 or 3 sets of ink cartridges to produce the required 500 copies. If you were using compatible ink cartridges, the ink would be likely to cost you somewhere in the region of €30! The quality might not be the same on a standard paper but for a quick turnaround job that may be advertising a one-day only sale for example it’s perfect. Compatible ink and toner is available at greatly reduced prices both locally and on-line and this just goes to strengthen the euro in our pocket as we begin to bask in the recovery of our economy.